Notebook Stand/Cooler Deepcool E-LAP Grey up to 15.6"
* Unique design of butterfly appearance & natural color combination. * Soft spongy material makes the notebook on your lap comfortable. * Ergonomic design offers a nice angle for typing and viewing. * 14cm fan with speed adjustable offers quiet & efficient airflow. * Pass-through connector for additional USB device. 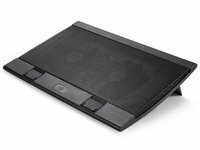 Notebook Stand/Cooler Deepcool U-PAL Black up to 15.6"
Notebook Stand/Cooler Deepcool N180 FS Black up to 17"
Notebook Stand/Cooler Deepcool WIND PAL FS Black up to 17"